This educational program is targeted to gastroenterologists, hepatologists, oncologists, internists, surgeons and interventional radiologists. Explain data on the prevalence and consequences of HCC in the general and underserved and minority populations. For additional information please call 888-565-5321 or email staceys@focusmeded.com. This activity has been planned and implemented in accordance with the accreditation requirements and policies of the New Mexico Medical Society (NMMS) through the joint providership of Rehoboth McKinley Christian Health Care Services (RMCHCS) and The Chronic Liver Disease Foundation. RMCHCS is accredited by the NMMS to provide continuing medical education for physicians. RMCHCS designates this live activity for a maximum of 0.75 AMA PRA Category 1 Credits™. Physicians should claim only the credit commensurate with the extent of their participation in the activity. 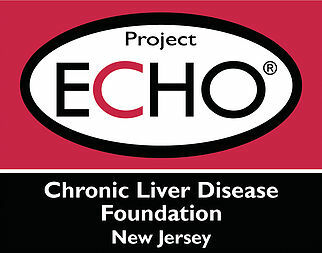 In order to support the growth of the ECHO movement, Project ECHO® collects participation data for each teleECHO™ program. This data allows Project ECHO to measure, analyze, and report on the movement's reach. It is used in reports, on maps and visualizations, for research, for communications and surveys, for data quality assurance activities, and for decision-making related to new initiatives. Educational grant from Bristol-Myers Squibb.